LG brings Google Cast to its multiroom Music Flow speakers and soundbars | What Hi-Fi? Owners will be able to use Google Cast to stream music from their Android or iOS device, Mac or PC directly to LG's Music Flow speakers. They will also have access to tunes from Google Play Music, TuneIn, iHeartRadio and Rdio, streamed from the cloud. 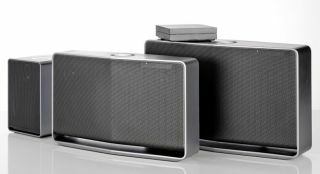 LG's Music Flow range includes the company's first portable multiroom speaker, the H4, which joins the H5 and H3 speakers, along with three soundbars - the HS6, HS7 and HS9. "We are pleased to announce that LG Music Flow will be among the first audio speakers to feature Google Cast," says Byung-hoon Min, head of the CAV division at LG. Other services incorporated into LG Music Flow products include Spotify Connect and Deezer. Google Cast will be available on most LG Music Flow models this month (April), with the H4 portable getting the upgrade by the end of May. Current owners of the relevant models will be able to upgrade their products "over the air", says LG.